I’ve had a few people show pictures of the lovely food from Inakaya, and had been meaning to check it out for a while. It’s on Willowdale Ave, one tiny street north of Sheppard. There’s a regular menu, in addition to seasonal dishes — and even then, many items might be unavailable depending on market availability. 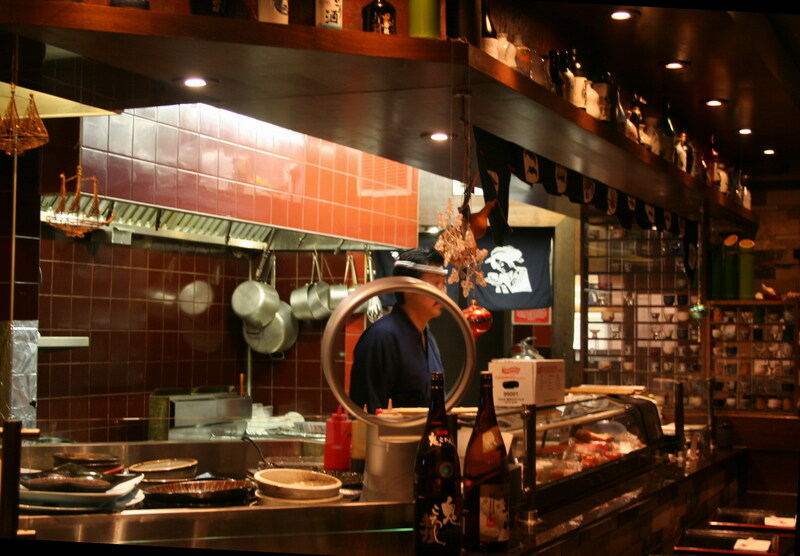 Inside Inakaya, there’s two or three chefs behind the bar, working on either fish or the charcoal grill. The charcoal smells was filling the air the entire evening, and certainly whet our appetities. There’s bar seating, and then about 7-8 tables of 4, so a very cozy squeeze. 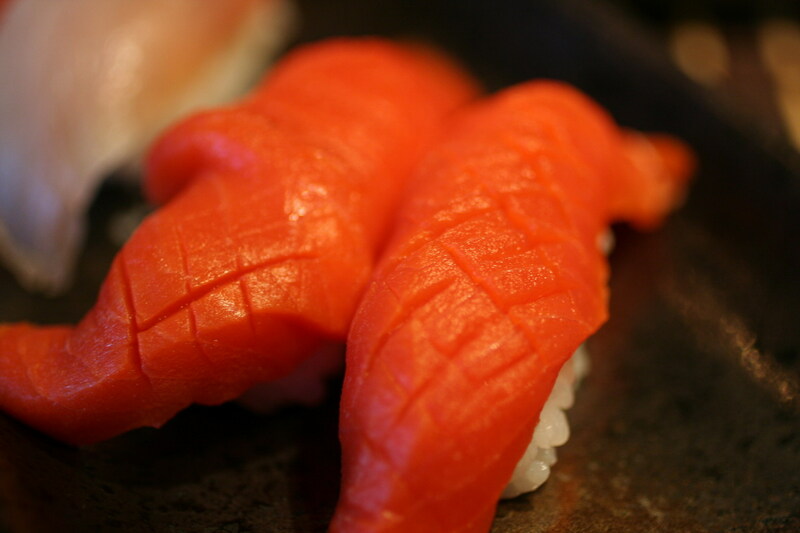 Wild Sockeye Salmon nigiri (2 pc $6) was available on special. The flavour is just as mild as salmon, but a much firmer, meatier texture. The slices are thick and generous, but balanced with the amount of rice. 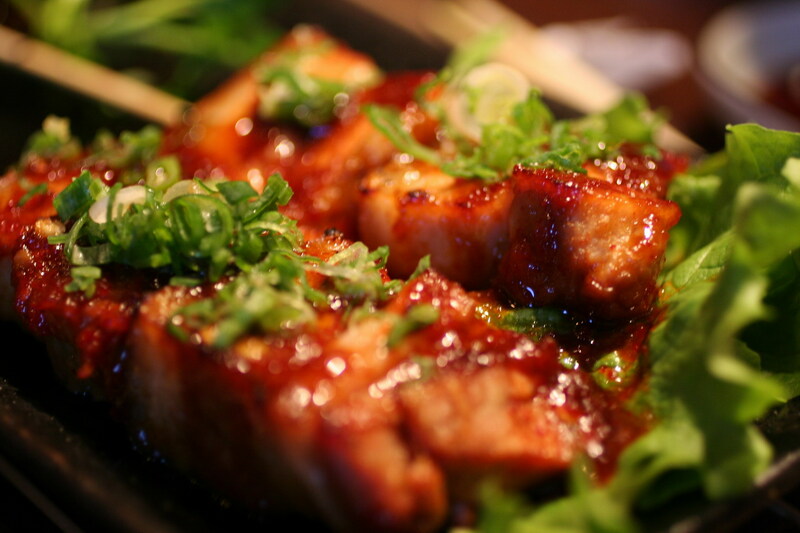 Grilled Pork Belly (2 skewers, $8). Large cubes of belly, they felt braised, sauced, then grilled. Definitely very tender, but the spicy bean sauce really overwhelmed any smoky flavour from the grilling. That being said, the bean sauce was a great mix of sweet and spicy, so is good on its own right. Tuna and Tai from the sushi dinner (Sushi Mori 8 pc nigiri 6 pc maki, $26). Slivers of lemon rind on the Tai added a very nice sweet bitterness with lemon aroma, with wasabi underneath to add more complexity. I found this to be the most interesting piece of the evening. Salmon, Hamachi, and Shrimp from the Sushi dinner (Sushi Mori 8 pc nigiri 6 pc maki, $26). All the cuts of fish were substantial and meaty, so that you could taste the texture of the fish, and not be overwhelmed by the rice. Scallop, Salmon Roe, and Eel nigiri from the Sushi dinner (Sushi Mori 8 pc nigiri 6 pc maki, $26). The eel had a dusting of possibly green tea powder? 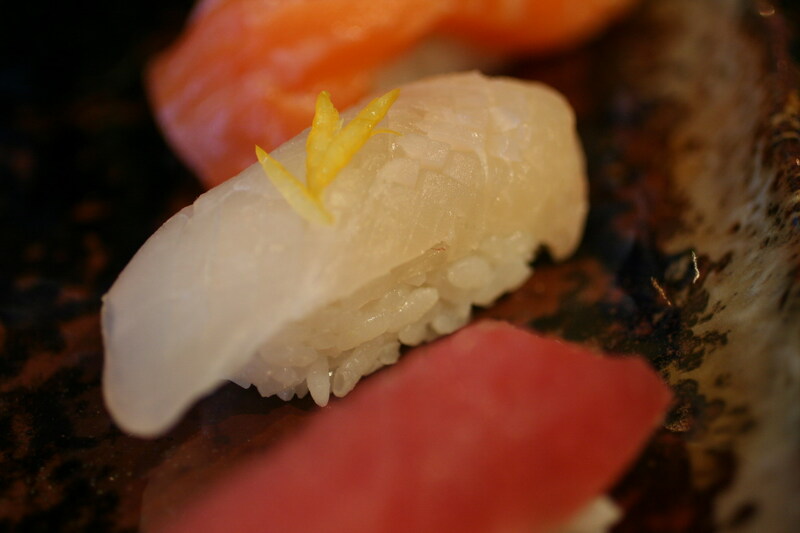 Baby Hamachi nigiri (2 pc $6) was also on special .. I’m not an expert on hamachi, however. The nigiri already has wasabi added underneath. Grilled Hamachi with salt (1 pc, $12). 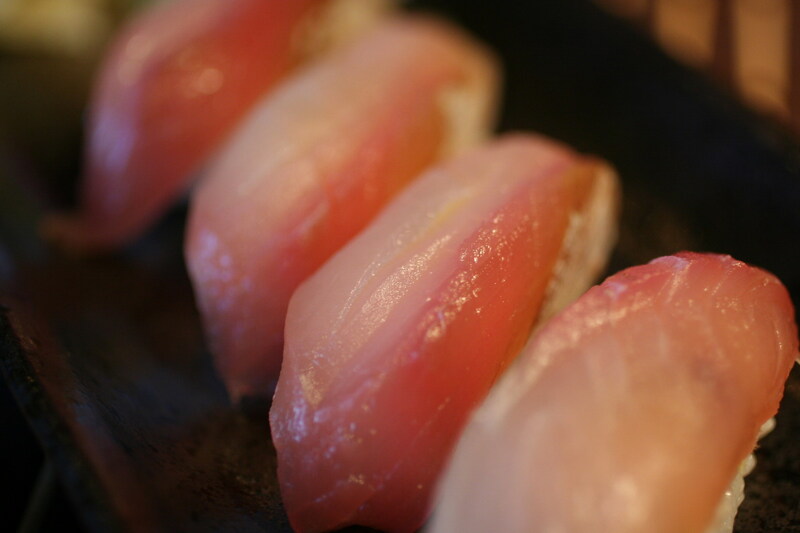 Hamachi, when cooked, is actually firm fish, and not very fatty. Interesting to taste a fish that’s usually eaten raw. The grilled pepper was quite spicy. The small mound of grated radish/daikon on the side was slightly sweet and helped “cool” your palate. 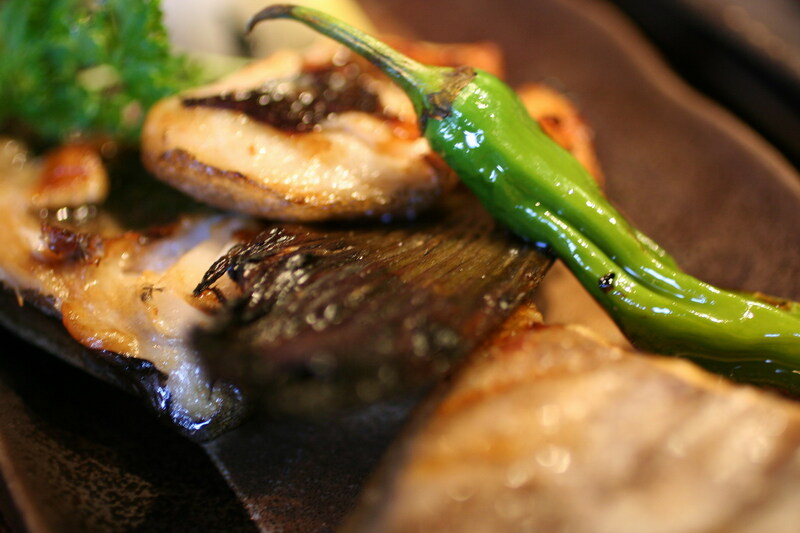 Grilled Black Cod Neck (Gindara Kama, 3pc, $8). 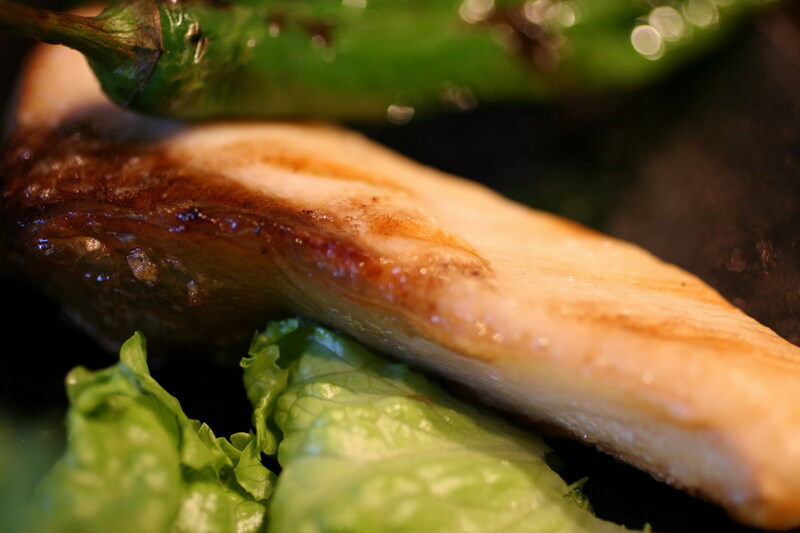 Surprisingly firm, compared to miso black cod meat, yet still very fatty and juicy. As you separate the neck meat, you had to be careful not to drip juice all over. Not very bony at all, and the skin was crispy and smoky. 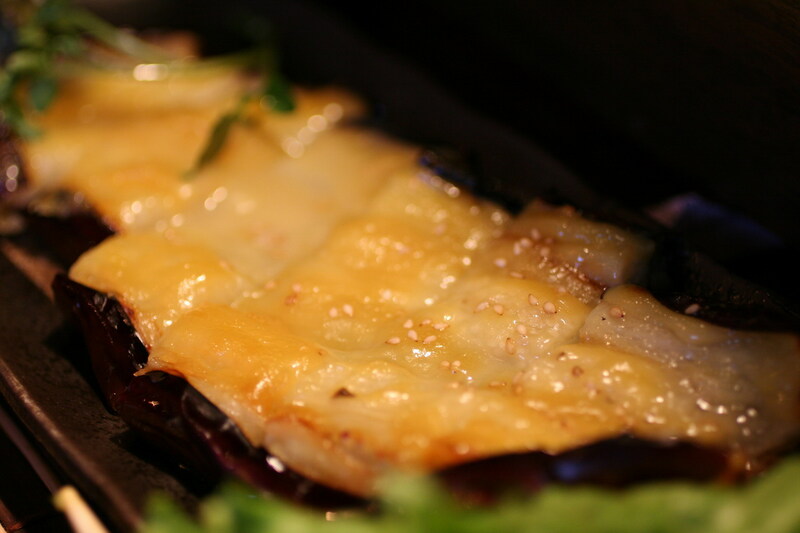 Eggplant with Miso (nasu dengaku, $7) was a bit disappointing, as the miso was very timid and a bit sweet. It almost tasted like a grilled banana, with a hint of savouriness. 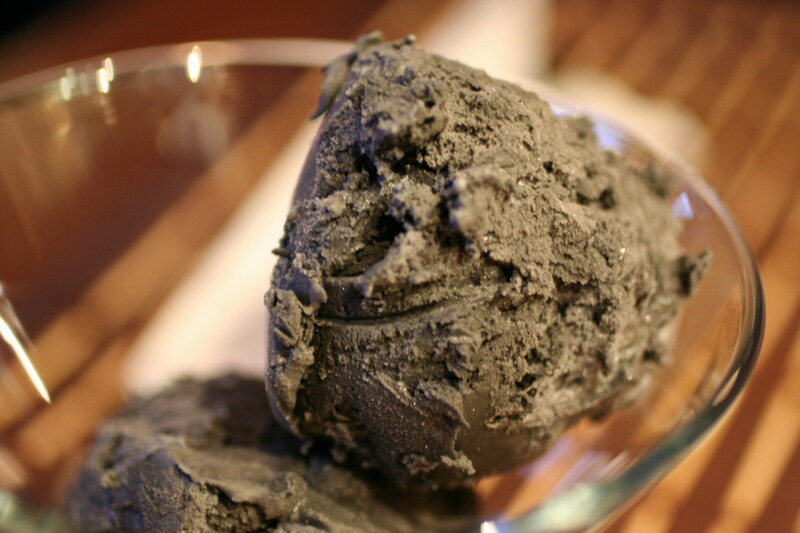 Black Sesame Ice cream ($5), while not made in-house, is not your normal store-bought Hime brand. You can taste the nutty toasted black sesame and slight saltiness to really bring out the sesame aroma. It’s not at all sugary, and not particularly heavy on cream. 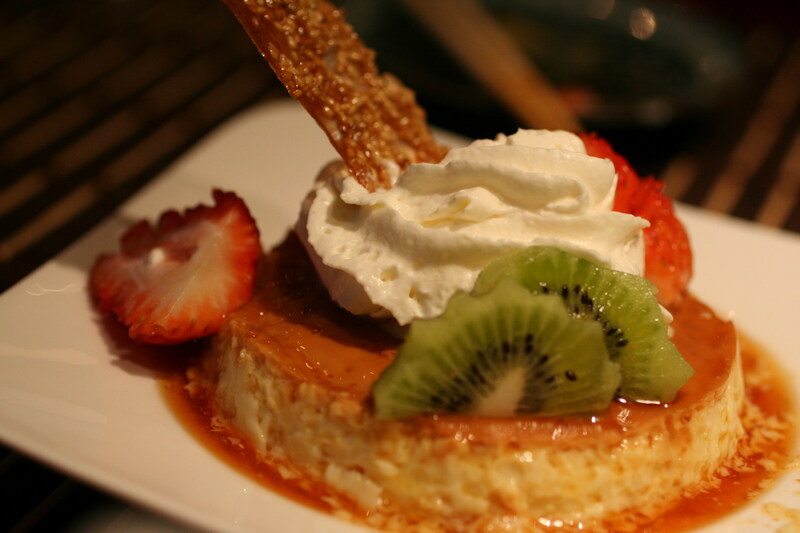 Creme Caramel/Custard Pudding (large, $4.5), made in-house. Wasn’t very stand-out at all. There are other unique dishes offered at Inakaya, such as a flaming volcano roll (served on a bed of salt, set on fire) and an individual charcoal grill for table-side cooking, but I’ve heard that the taste doesn’t quite live up to their visual appeal. Their focus on fresh seasonal ingredients should really be the main draw. 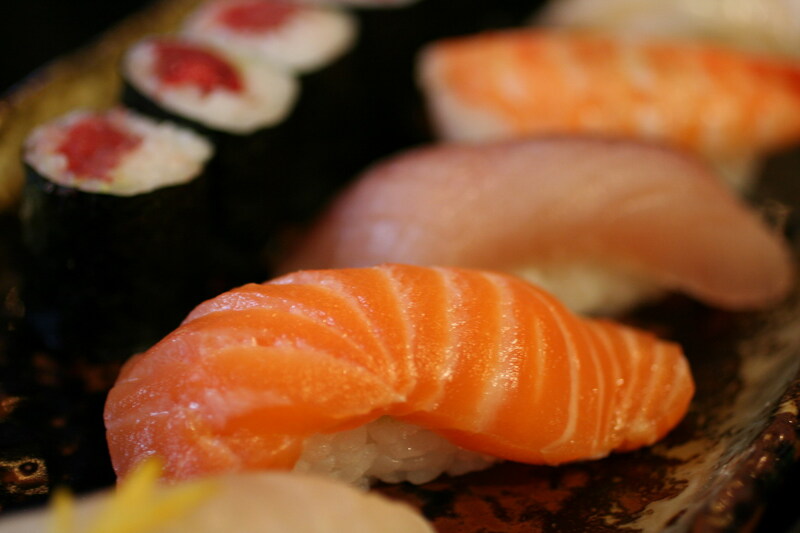 The close up pictures of sushi and fish leave me very very VERY hungry! @Mary, thanks for the suggestion & recommendation — if I need to wow (or burn) my dinner companions, I’ll definitely keep that in mind! It’ll absolutely make for a great close-up photo! 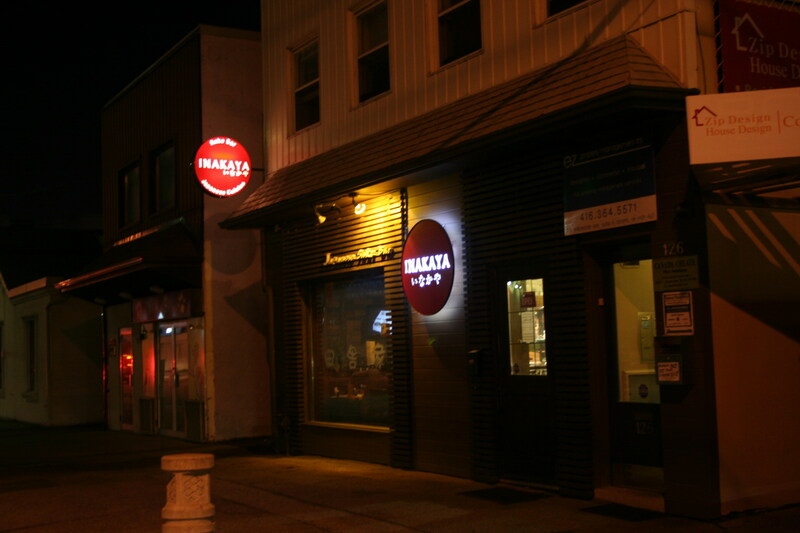 This is my favourite japanese restaurant!! But it’s so expensive I can only go their like once a year or so -_- I like the Rock n’ Roll more than Volcano Roll. I’ve actually never had any of their rolls before!! 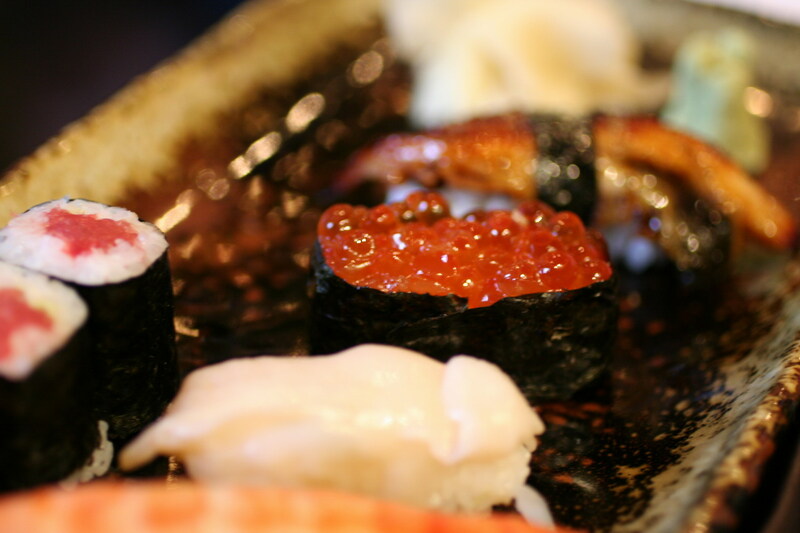 I end up having the hot foods and nigiri sushi, figuring I could get rolls elsewhere. But yes, this place has that great balance of cooked and raw items, and top notch at both (for most items).